HornerXpress Worldwide would like to introduce you to a one-of-a-kind bubbler. 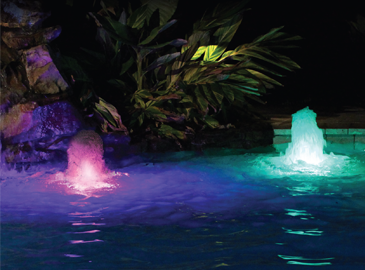 KBK Technologies' energy efficient LED Color Cascade Bubbler will make your swimming pool come alive with 8 vibrant colors. Sit back, relax and unwind while listening to the soothing sounds of an aqua oasis. The Color Cascade Bubbler is ideal for sun shelf, beach entry, tanning ledges, fountains and pond applications. Visit our Color Cascade Bubbler webpage or contact your Export Manager to learn more.